Buffalo Bills presdient Russ Brandon first questioned the benefits of the "Bills In Toronto" series during a meeting with centre Eric Wood and fellow team captains about a month ago. He said he would continue to examine "everything." Bills centre Eric Wood was not at all surprised hearing team president Russ Brandon raise concerns whether Buffalo loses a competitive edge playing annual home games in Toronto. Brandon first questioned the benefits of the "Bills In Toronto" series during a meeting with Wood and fellow team captains about a month ago. "He knew that a lot of players have expressed some harsh feelings toward Toronto," Wood said Wednesday. "And he basically told us as captains that he was going to do whatever it takes around here to win. And that's something he wanted to address." Brandon went public with his concerns during his weekly show on Buffalo's WGR-AM earlier in the day. While noting the Bills' games north of the border have boosted the small-market franchise's revenues, Brandon added that they haven't paid off in wins. Following a 34-31 overtime loss to Atlanta on Sunday, Buffalo dropped to 1-5 in Toronto since the series was established in 2008. "It has been a challenged market there, and certainly has not translated into enough wins for us there," Brandon said. "Nothing comes above winning. When I took over the reins on Jan. 1, I said that was the No. 1 focus, and that will be the No. 1 focus. That's one of the reasons that this will be reviewed in a grand manner." Brandon stopped short of saying the Bills would consider or be allowed to opt out of the four remaining years of the deal, which they renewed in January with Toronto-based Rogers Communications. "I'm going to look at everything. I'll just leave it at that," Brandon said, before being asked a second time whether the Bills can opt out. "My focus in this organization is simple, to put ourselves in the position to win championships and sustain success. Period. Nothing comes above that." Wood has been among several players who have criticized the series. He called the games in Toronto "a joke" last year following a 50-17 loss to Seattle. Last week, receiver Stevie Johnson questioned whether the warm-weather Falcons "fixed" the schedule in getting to play indoors at the domed Rogers Centre, and avoid the wintry conditions - and traditionally more raucous environment - at Ralph Wilson Stadium in Orchard Park, N.Y. The loss put a big dent in the Bills' chances of staying in the AFC playoff race. At 4-8, Buffalo plays three of its final four on the road, beginning with a trip to Tampa Bay (3-9) on Sunday. Buffalo is in jeopardy of extending the NFL's longest active post-season drought to 14 seasons. And the Bills will go a ninth straight year without a winning record. The Bills are 0-4 at Toronto during December. Their lone win came on Oct. 30, 2011, when they defeated Washington 23-0. Rogers officials declined to comment on Brandon's statements. So did NFL vice-president Christopher Parsons, who heads the league's international offices. The Bills made the decision to play games in Toronto, about a two-hour drive from Buffalo, in a bid to expand their fan base and generate additional revenue from Canada's largest city and financial capital. A lack of home-team support and poor attendance remain issues since the series started. The announced crowd of 38,969 on Sunday was by far the smallest of the series, and well short of the stadium's NFL capacity of 46,470, not including suites. Rogers did announce the first four regular-season games had been sellouts before later acknowledging the totals included thousands of free tickets. The games also attract a larger than usual contingent of visiting team supporters. Several Atlanta players were pleasantly surprised to see a notable number of fans wearing Falcons jerseys in the stands on Sunday. "The crazy part is we had a lot of support here," Falcons safety William Moore said. "It didn't feel like we were in Canada." The series has generated revenue and lured more southern Ontario fans back to Buffalo. 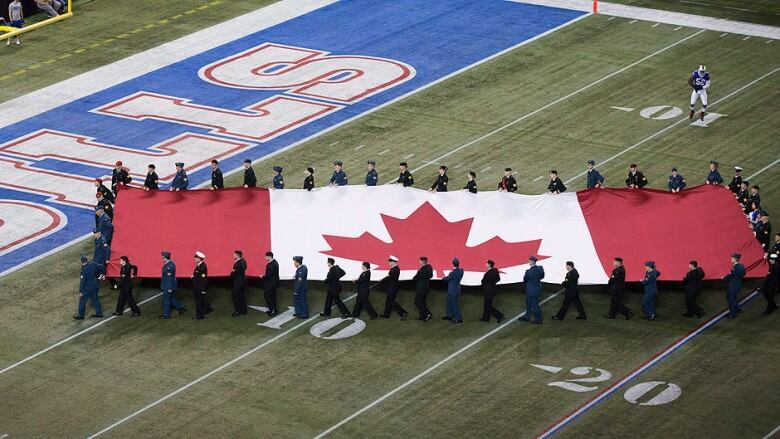 The Bills estimate Canadians now make up about 15 per cent of their season ticket base. That rivals the number of season ticket holders the Bills get from nearby Rochester. As part of the initial five-year deal, Rogers agreed to pay $78 million US to essentially lease eight Bills home games: five regular season and three pre-season. The final pre-season game was eventually dropped because of scheduling difficulties. In exchange, the Bills earned more than double what they usually generated from hosting games in Buffalo. The value of the most recent deal has not been revealed.